It's been a long time since I have written anything on UNIX or Linux commands, but today I'll talk about the lsof command, a utility command every system admin and developers love. The lsof command stands for list open file descriptors and as the name suggests, it is used to find open files by process. Since almost everything in UNIX are file, you can use lsof command to find an open regular file, a directory, a symbolic link, a block special file, an NFS mounted file, a socket stream, a shared library, a character special file, a regular pipe, a named pipe, an internet socket, a UNIX domain socket, and many others. I have mostly used it to find all the files opened by a particular process, which I will show you in the coming section. It's an incredibly useful tool to do debugging and troubleshooting in UNIX and Linux environment, and because of its versatile nature, it's also known as the "The Swiss Army Knife of Linux". Since most of the production system runs on the UNIX-based operating system, knowledge of this tool become even more important. As a Java developer, I often use lsof command to find all the files opened my Java process, or some time to find which process has opened a particular file e.g. a file which is used to represent a cache in memory, lsof is incredibly useful on doing that. In this tutorial, we are going to learn different ways and options to use lsof some task, which will further help you to find process and file related information in UNIX or Linux. You can combine the lsof with grep command for advanced search and filtering. I often use grep command to filter output based upon file name, process id or file type. If you are not familiar with basic commands like grep and find, then I suggest you take a look at Linux Command Line Basics on Udemy, a basic course for any programmer, tester, data security people or anyone, who work on UNIX and Linux based environment. The lsof command generally comes pre-installed in many UNIX systems. If you are getting -bash: lsof: command not found an error while using lsof then it could be that lsof is not in your PATH. Just check /usr/bin or /usr/sbin folder for this command. If you don't find there then you can install it from source or you can ask your UNIX admin to do that for you. Simply running lsof without any argument print all opened file and process. This is not particularly useful but a good starting point. will list all the process which has opened this file. you can see the command, PID, user, and full file path to find out the process. 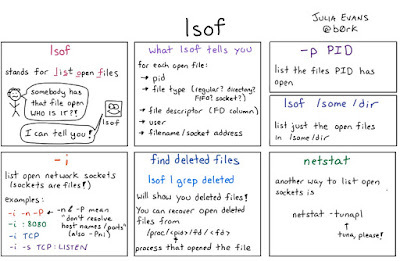 If you are struggling to remember these lsof command options, here is a nice diagram from Julia Evans which will help them to remember. If you want, you can also join the Learn The Linux Command Line: Basic Commands, a free course on Udemy for learning essential Linux commands for FREE. This is better than using grep for filtering, as instead of writing lsof | grep java, you can just write lsof -c java. Just like multiple users, you can also combine multiple processes name to list down files hold by them e.g. This will list all files opened or hold by root user + all files opened by the java process. See Linux Command Line Interface (CLI) Fundamentals, one of the great course to learn Linux command line on Pluralsight. Like the previous option, you can also combine user and process by using lsof option '-a'. This is like the AND logical operator and will only list files, which matches both options e.g. Similar to AND and OR operator used earlier, you can also use negation operator with lsof command e.g. will list all files opened by the process with PID 17783.
will list all files opened by the process with PIDs 17783,17754,17984. 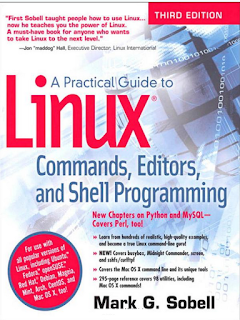 You can also see the Practical Guide to Linux Commands, Editors, and Shell Programming 3rd Edition by Mark G. Sobell to learn more about how to find a process in UNIX. will list all process with open internet sockets. You can even names defined in etc/services instead of port number e.g. will print process using the SMTP port. will print all deleted files which are claiming disk space. You can just kill the process which is holding the reference of those files and get back your disk space. The command will also print the process id to help you kill the process. You can just kill command for that. 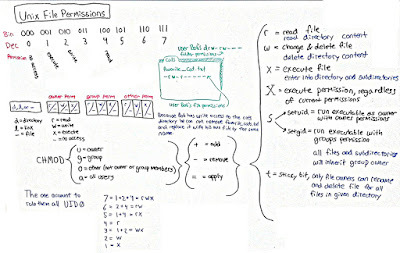 That's all about 10 examples of lsof command in UNIX and Linux. As I said, it's incredibly useful to find the list of files opened by a particular processor to find all the process which holds a lock on a file. Since almost everything is a file in UNIX, you can use lsof to find out open socket, directory, symbolic link, internet socket, and many others. You can also see the lsof man page for full documentation and more options. Thanks for reading this article so far. 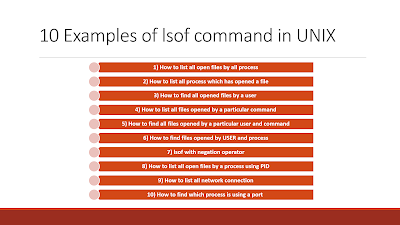 If you find these lsof commands useful then please share with your friends and colleagues. If you have any questions or feedback then please drop a note. P. S. - If you are serious about improving your Linux skills then I also suggest you look at the Learn Linux in 5 Days and Level Up Your Career course on Udemy. It's a great course for everyone and you will definitely learn some useful tips to work better in Linux. Thanks you unknown, glad that you find these lsof command examples useful. Great collection, thank you for sharing this. Thanks you Biwajit, happy that you found these lsolf examples useful. You can also use lsof command to free disk space from delete files. You might not know that even if a process deletes the file but holds the reference of file descriptor the space is not freed. This means if your process is creating cache files and deleting but not you are not restarting process or release file descriptor you may end up with no space in the file system because of those deleted files. We have been facing space issue quite often in our app server. Whenever I use find command it doesn't produce output which adds upto total size. For example, the /app partition has 100GB, find list some top 50 files adding upto 6 or 7 GB but partition was still showing as 100% full. After more investigation we found that the space was hogged by deleted files. Our process was creating cache files and deleting them but keeping the file descriptor. Since our process only starts on Sunday, it hold a lot of reference of deleted files which holds those missing 50+ GB space. After that, I found the process using ps -ef | grep "text" and kill that process. So, if find command doesn't show you enough large files to delete, use lsof command and check if your process is keeping reference of deleted files and hogging up space.